The ride to the airport runs through a barren, swampy, barbedwire mess. 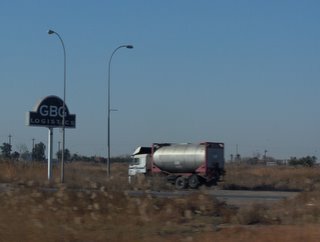 There are a few billboards, but the several signs announcing GBG Logistics are the most conspicuous. These are the only advertisements for American contractors in Iraq that I've seen outside the Green Zone and other restricted areas. There's no contact information on the signs, so I wonder if they're advertisements to generate new business or intended to credit GBG with work done nearby. Its unclear. GBG's work in Iraq, like the signage, was all bluster. GBG's owner is now charged in federal court. How long until these signs are taken down? GBG must be the worst company to represent American contractors to Iraqis.